An array of specially designed digital fingerprints called crypto-anchors could be the answer to the counterfeit conundrum within the next five years, according to tech giant IBM. In the firm’s annual “5 in 5” technology predictions, IBM says cryptographic anchors, such as tiny computers or ink dots, will be embedded in everyday objects and devices as a way to counter counterfeiters. Building on the interest of blockchain in securing supply chains, the crypto-anchors will be used in tandem with this distributed ledger technology “to ensure an object’s authenticity from its point of origin to when it reaches the hands of the customer”. “These technologies pave the way for new solutions that tackle food safety, authenticity of manufactured components, genetically modified products, identification of counterfeit objects and provenance of luxury goods,” said Arvind Krishna, head of IBM research, in a blog post. The company believes the technology, which is being developed by IBM researchers, will reshape business and society within the next five years. The crypto-anchors are essentially tamper-proof digital fingerprints that are embedded into products to work alongside blockchain in the physical world. The crypto-anchor works to tackle counterfeits by authenticating a physical object’s origin and contents and linking this provenance information with the digital blockchain record to ensure the data between the two technologies matches in the real world. This doubly enhanced approach to securing the supply chain, according to IBM, is based on the fact that blockchain technology, while poised as the future of digital transactions because of the transparency it brings to the supply chain, cannot ensure the authenticity of physical goods by itself. The company has developed several different forms of crypto-anchors including a tiny computer smaller than a grain of rock salt, an edible ink which could be stamped on malaria pills and other optical codes that are invisible and have to be activated. 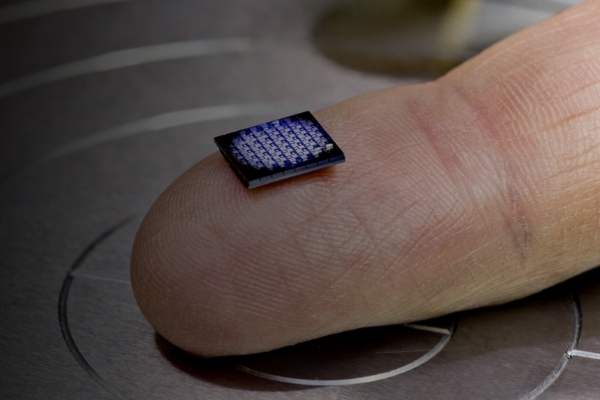 The micro-computer will consist of several hundred thousand transistors to monitor, analyse and act on data, yet will cost less than 10 cents to manufacture. IBM scientists have also created a crypto-anchor that combines a mobile sensor (or smartphone) outfitted with a special optical device and artificial intelligence algorithms to learn and identify the optical structure and features of certain objects. It can also identify the presence of DNA sequences in minutes. The crypto-anchors are described as highly secure because they are embedded in the product and consist of cryptographic mechanisms that provide unclonable identification, IBM said, adding that the technology would make counterfeiting “nearly impossible”. The first models could be made available in the next 18 months and within the next five years, advances in microfluidics, packaging platforms, cryptography, non-volatile memory and design will mean the technology could be widespread in the marketplace, IBM believes. “We are saying in the next five years, crypto-anchors will halve the number of counterfeit goods that are linked to health and safety issues,” IBM researcher Andreas Kind said.